Vintage machines might be old, but they're definitely not out of date. 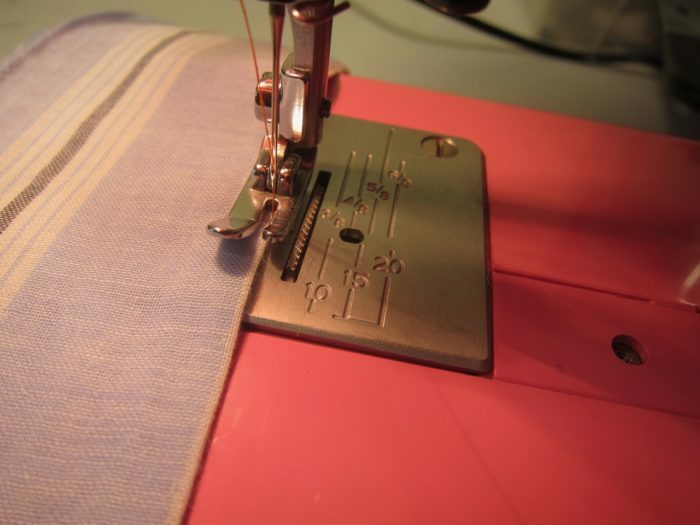 Before there were zigzag machines, home sewing machines were solely straight-stitch. These easy-to-clean, easy-to-maintain machines did one thing and did it well—so well, in fact, that many garment sewers (myself included) prefer sewing with them today. The greatest strength of these machines is their precision. Look closely at the design of the original straight-stitch foot. The “finger” on the right side is just 1/8 inch wide and visibly shorter than the one on the left. 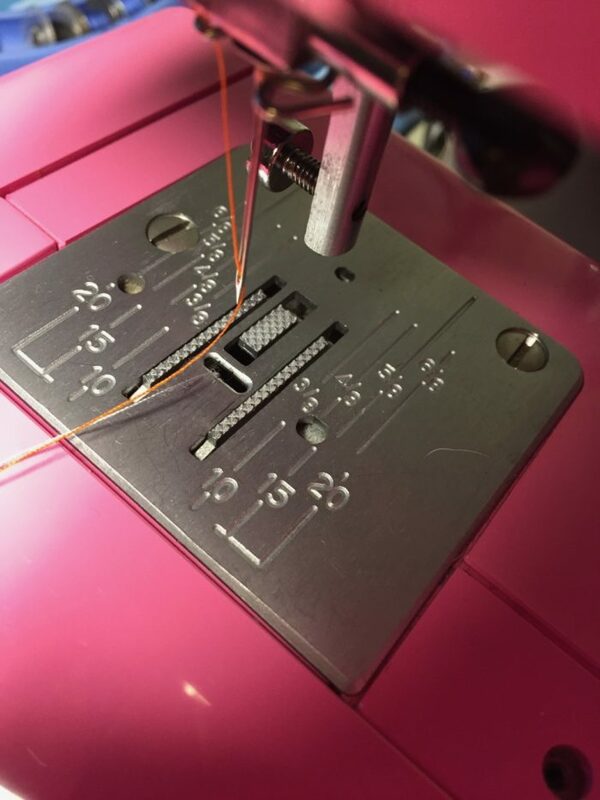 If you’re edgestitching or topstitching, you can get right up to your stitch line with a classic straight-stitch foot and your stitch area is easy to see. 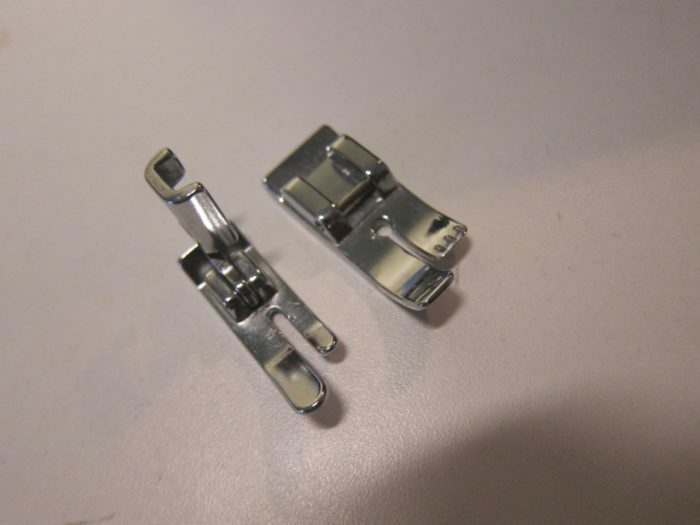 You have much better visibility than you would with a zigzag foot or the inexpensive contemporary straight-stitch feet you find included with many new machines (as well as those snap-on presser feet kits). 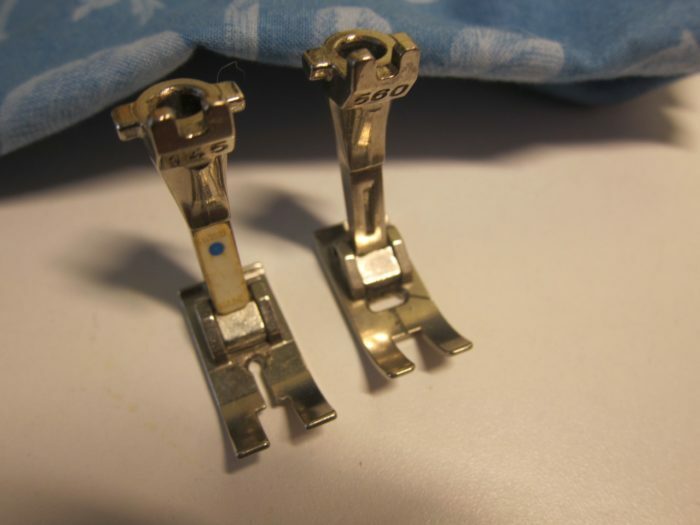 Even this Bernina straight-stitch foot (left) offers about the same (poor) visibility as the Bernina zigzag foot (right). 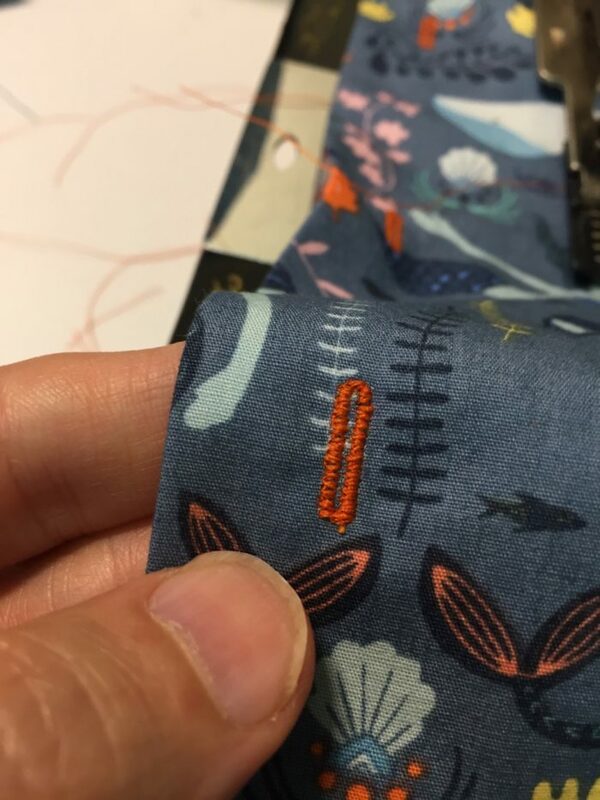 As someone who sews a lot of menswear, particularly shirts, I find a straight-stitch machine a necessity due to the large amount of accurate topstitching and edgestitching required. The fact that they’re also a pleasure to use because of their solid construction and simple design is icing on the cake. Another virtue of straight-stitch machines is the tiny size of their needle hole and the narrowness of their feed dogs. 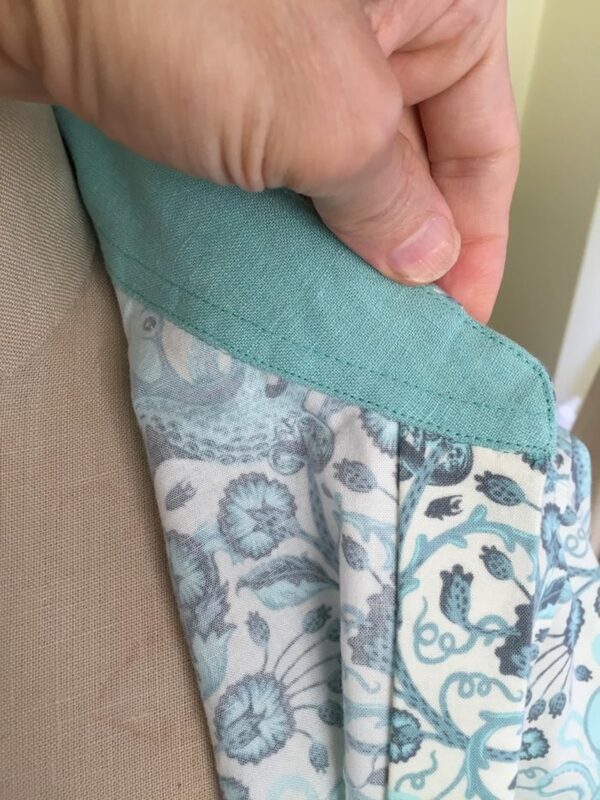 A tiny hole means that soft, lightweight fabrics like chiffon and gauze are unlikely to be pulled through the hole, which can easily happen on a zigzag machine, whose needle hole must accommodate the zigzag’s widest stitch setting. The narrow feed dog design means that narrow strips of fabric or fabric edges being topstitched are more likely to be supported by both sets of feed dogs instead of just one. On this contemporary Janome, notice how widely set the feed dogs are. Here, I’ve attached my Singer straight-stitch foot to the machine. This is a cheap alternative to purchasing a vintage straight-stitch machine, though less than ideal. There are a number of things a straight-stitch machine cannot do. Obviously, it cannot zigzag, hence, it’s not ideal for knits. It cannot make a satin stitch or bar tack. 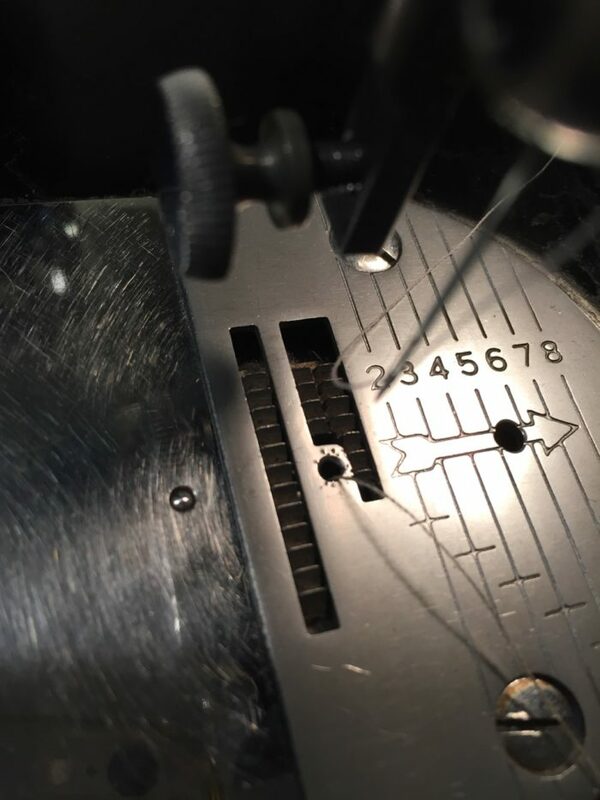 Zigzag machines generally have a built-in buttonhole function as well as the ability to create embroidery stitches (sometimes a great many); straight-stitch machines lack these extras. But there was an attempt to make straight-stitch machines more versatile. Companies like Greist and Singer created straight-stitch sewing machine attachments that enabled these basic machines to perform extra functions. 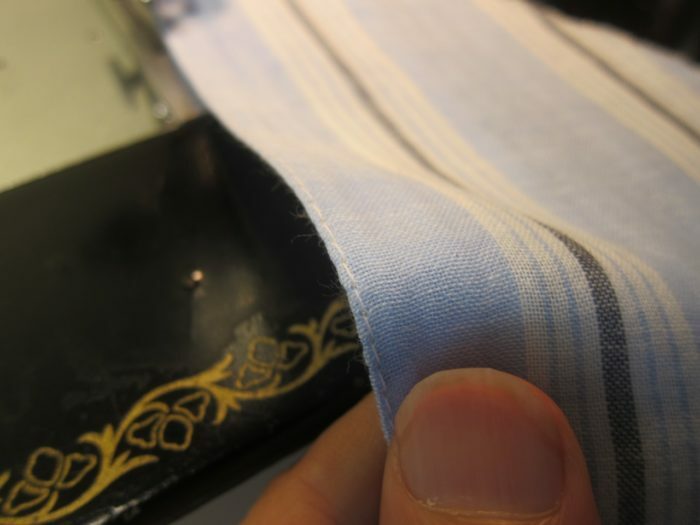 Their mechanical buttonholers create sturdy buttonholes by moving the fabric (as opposed to the needle) in a zigzag motion. The earliest buttonholers were fully adjustable (buttonhole length, stitch width, stitch density, size of hole), but were unable to produce a keyhole buttonhole. The next generation were not as adjustable since they used metal or plastic cams, but they did allow the option of keyhole buttonholes as well as a perfectly round eyelet. Many sewers continue to use these vintage buttonholers successfully today, and they can be found inexpensively on sites like eBay. I make virtually all my buttonholes with these attachments. 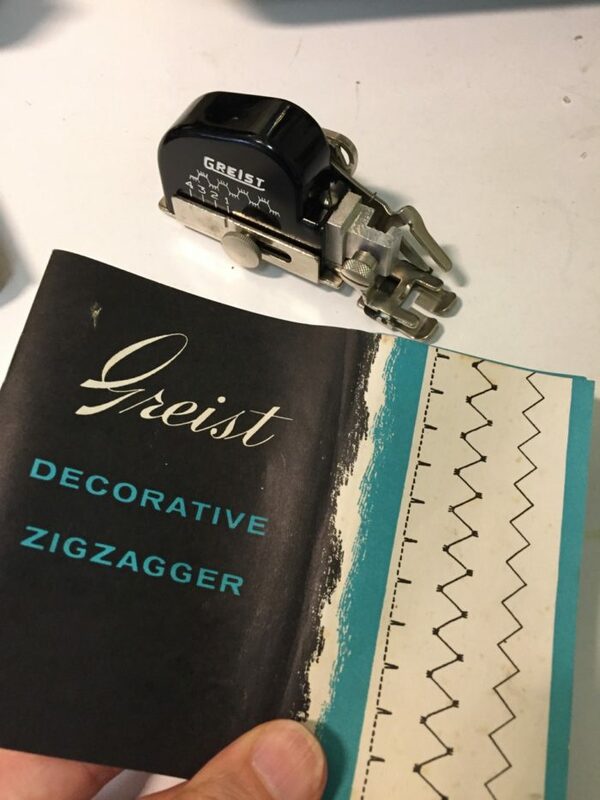 Greist and Singer also manufactured a zigzag attachment that gave straight-stitch machines the ability to stitch a basic zigzag and a blind-hem stitch, again by moving the fabric from side to side, instead of the needle. Once zigzag machines became ubiquitous and affordable, straight-stitch machines began to be phased out. By the mid-1960s, they were gone for all but industrial use. Sewing is fun to write and read about but it’s best experienced first-hand. If you own a straight-stitch sewing machine or know someone who does, give it a try and see how you like it. 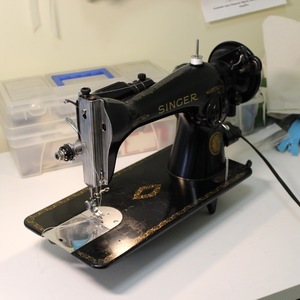 Vintage straight-stitch machines are easy to find, since most people no longer use them. I recommend picking one up from someone who inherited one or at a thrift store or garage sale. 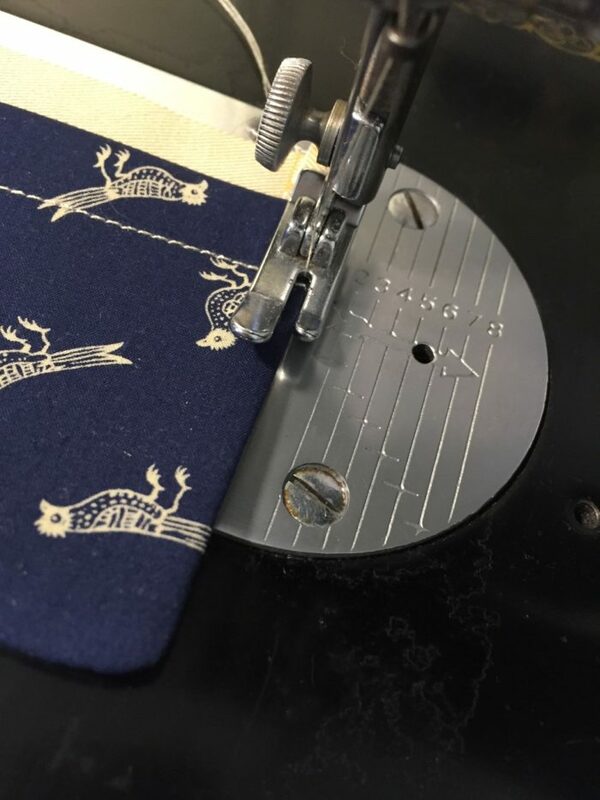 No machine topstitches better, and even the most generic all-metal straight-stitch machine (and straight-stitch machines were made almost entirely from metal) can sew through multiple layers of heavy fabrics better than a contemporary zigzag machine. Provided you have the space for a second machine, it’s a useful tool. When you need a zigzag stitch or bar tack, you can pull out your zigzag machine. Otherwise, your straight-stitch machine should be able to handle the job and, based on my experience, will do so more accurately. 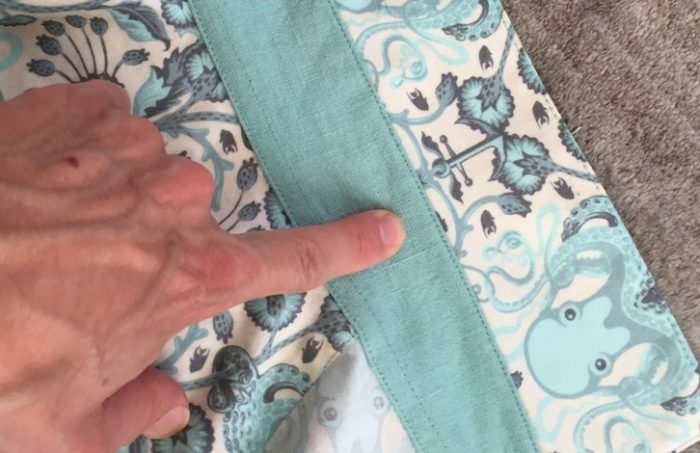 Is there a straight-stitch machine in your sewing room? I am a little troubled by the Needle Hole in the Needle Plate shown in Pic # 10; obviously that poor plate has taken a beating with needles striking it. A New Needle Plate can be purchased for many of the older machines even nowadays, otherwise the hole can be smoothed out with very careful application of a string impregnated with a fine abrasive such as a Dentist uses to clean between teeth; thread the string through the hole and carefully see-saw it around the edge. Otherwise you can use a minute bit of a French Manicure Emery Board; working with the coarsest through to a finer 'grit'. As well, in both Pictures #4 and #10 the screws which hold the Needle Plate in position appear to have oil or dirt trapped both in their slot and around their stem where they screw through the plate. One HUGE advantage of an older machine is that their mechanics are so much simpler; regular cleaning and oiling can be done by any sewer. There are some great Internet groups for both specific Makes of Machine; Singer, White, even for "Similar to but not actually made by" machines originating in Asia and so on, and for People Powered; Treadle or Hand Crank, as well as more general sites for Older Straight Stitchers generally. Between them you can usually find a downloadable Owners Manual for a machine, or for a very similar model, which will guide you in maintaining it in good working order; oiling and cleaning. And with fewer Mechanics used to working on Oldies but Goldies, plus the prices charged, the cost of some clean rags, a clean paint brush, some SEWING MACHINE OIL (Not Water Displacement Stuff, or Multipurpose Oil Substitute) and a little time anyone can soon learn how to keep their "Darling" in top form. I absolutely love my treadle Singer 66 (1926 vintage). It sat as an ornament for four years!! Then I got it serviced and started using it... boy am I kicking myself. It is the perfect heavy denim machine, and then I can go straight to sewing fine silk shirts without changing anything. 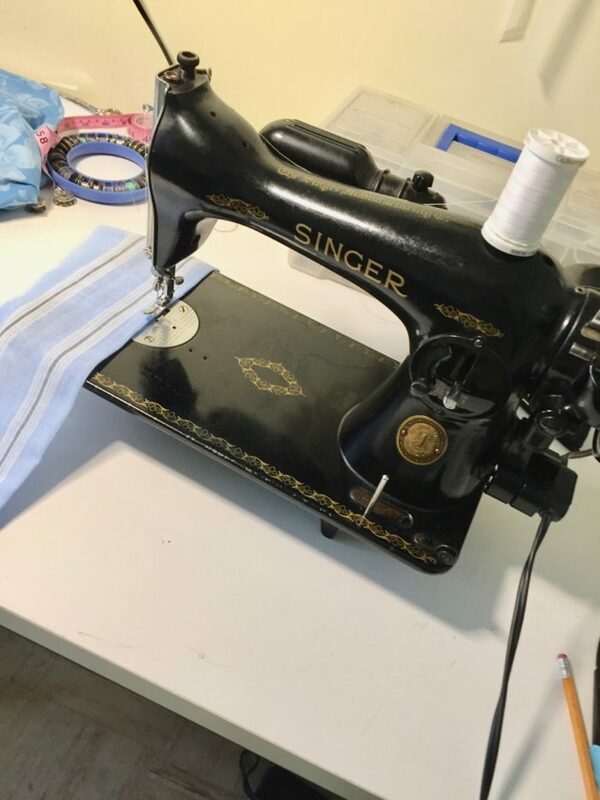 I would urge any sewer who likes to sew very heavy AND very light fabrics to consider an old straight stitch singer. 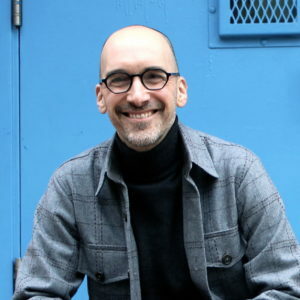 Like the author of this article, I use mine frequently. YES, for the topstitch with that original two-length sides foot, I also love using my grandmother's straight-stitch machine and Geist attachments; it is a 1940's New Home NLB (although it is a bit noisy). I also have my great-grandmother's Minnesota D treadle in working order when I don't want to use electricity: it was purchased by her in 1904 with a huge assortment of Geist attachments. I bought extra bobbins and needles for both of those machines when I could locate them and still see them on eBay sites. Both have great cabinets with several drawers. Note: For most sewing, I've mainly used my "modern" machine since 1972; it is a very heavy "portable", an all-metal White zigzag and decorative-stitch cams. Like the New Home NLB, it is a great machine for sewing through several layers of denim or cotton duck fabric. I wasn't fortunate enough to inherit my grandmother's Singer, a treadle machine that was eventually converted to electric. I do have a Singer buttonhole attachment and also a zigzag attachment with an assortment of tiny discs/cams. I have no idea what to do with them actually, as I can't use them on my vintage Bernina (807 Minimatic) - not enough space on the machine. Regarding your Bernina feet, the one on the left actually looks a lot like today's jeans (#8) and 1/4" feet (#37). 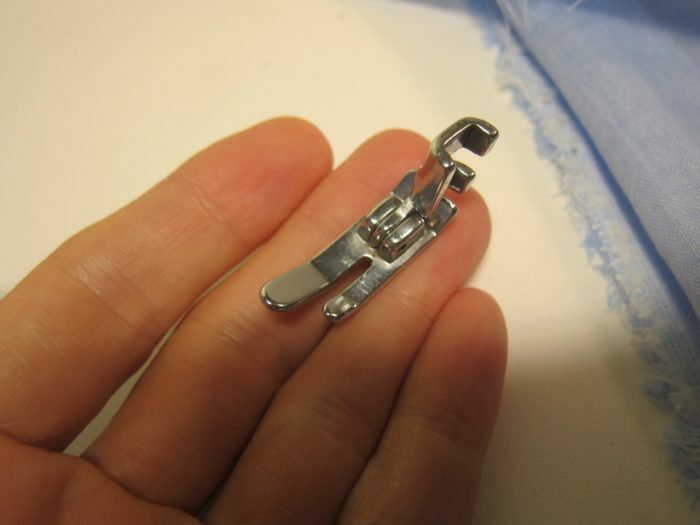 Bernina does have a modern straight stitch foot #13, that looks almost exactly like your Singer's straight stitch foot. I use that one with the straight stitch needle plate on my computerised Bernina, but never knew I could sew such delicate edge stitching with it - thanks for the tip! I can also imagine the delicate folded tucks that can be sewn with that combination! 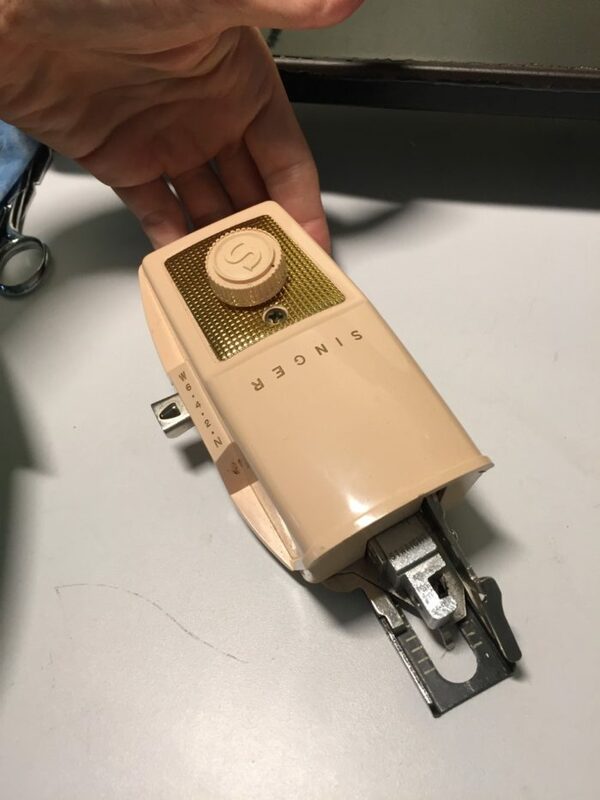 I will now start to search online for an original vintage Singer straight stitch foot for use on my Minimatic - the vintage Singer feet fits both my Bernina machines, happily. 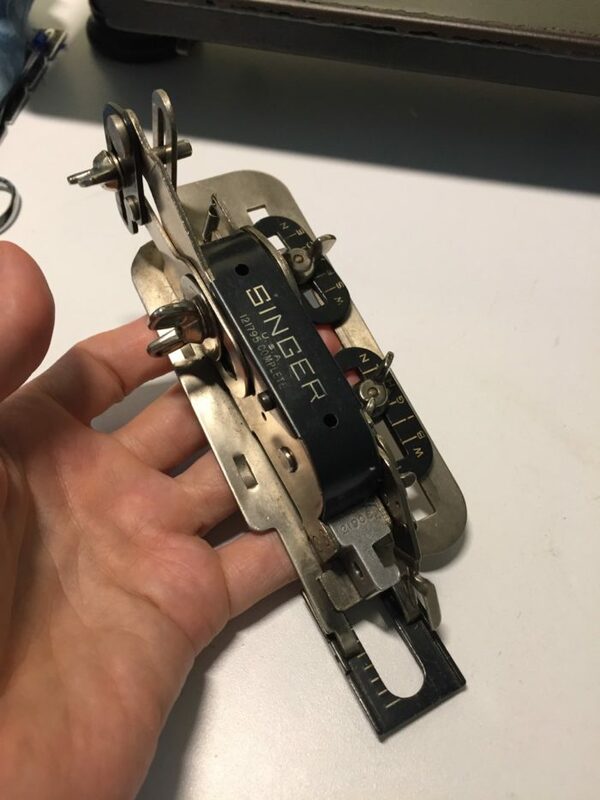 Singer made the most ingenious attachments/feet and I have all the ones that came standard with the machines. Nice article. I grew up learning to sew on Mom's wedding gift 221. You hit the nail on the head about the straight stitch. The good news for any searching for these, is that literally millions of machines, based on the model 15 shown in your article were made since the turn of the LAST century. They are not difficult to locate if one is persistent! I used the Singer buttonholer for years, but is has it's limits and doesn't always produce a smooth result. 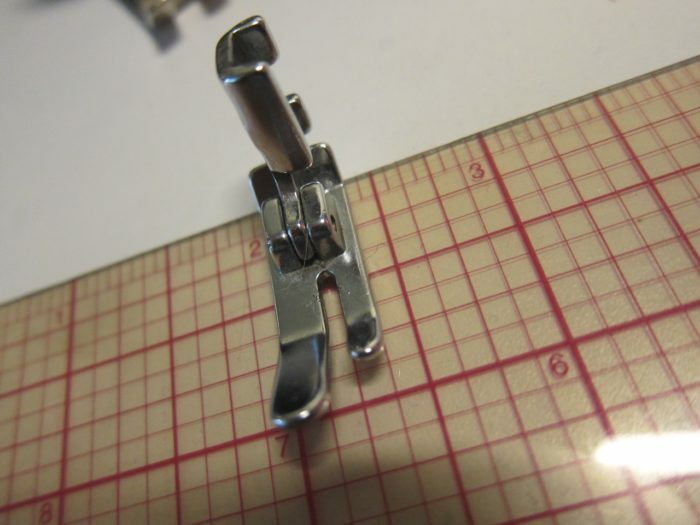 After many years of breaking out the buttonholer to do buttonholes, I discovered the joys of truly perfect buttonholes made I use my computerized Husqvarna Viking when I need really beautifully done buttonholes for wovens. But yes, the old ones do such lovely edgestitching… I still keep a couple around just for that purpose! I’m absolutely sick that I donated my moms Singer sewing machine. I was too young to appreciate what I had in my possession. My mom bought the machine a few months before I was born; April 1960. Every time I tried sewing, I had problems with the tension. Now that I’m nearly 60 and enjoying my passion for sewing. It was me all along. I just didn’t know how to use the machine properly. Today I am loving my 1931 Featherlweight It was using this machine that made me realize I had parted with a perfectly good machine. I’m heartbroken over parting with it. The only choice I have is to move forward and enjoy my new Featherweight. I cannot say enough about how wonderful these little tanks are. The stitches are always perfect!! Thank you for your article; I loved it. Thank you for this article! I recently picked up a 1923 Singer at an auction for $120 and had it cleaned and refurbished for another $95. It’s non-electric, with a smoothly-operating hand crank. I’ve been acquainting myself with the machine and sampling different fabrics. I absolutely love the control of the stitches and plan to use it for most of my sewing. This article helped me understand and appreciate how the vintage machines are different and the value they bring to contemporary craftsmanship. Thanks again! I have several straight stitch machines, but only two are going properly. One is my grandmother's 21st birthday present from her employer at the time, a Harley St doctor, a 1925 Frister and Rossman VS. The other is a totally modern Janome 1600P. I love that machine and use it in preference to all the others for straight stitch.